Awards of the Arab World - full size & miniature. British awards to Arab recipients. Medals of Azad Hind & Bahawalpur. Gentlemen, I attach a series of images I took at the Abdine Palace - apologies they are not of the highest quality, but they do show the variety of badges in this scarce series. The quality of production is superb. Regards, Owain. Rusty, A great summary on the dimensions - your thread and research has become the 'go to' location for the details of this order. Thank you for your research. Regards from Riyadh, Owain P.S. With regard to the Rauch set of miniatures illustrated in your previous post, probably to a French recipient, it would appear that one of the awards is an 'extra' either added by the recipient to his chain - rather than get a longer chain, or perhaps added much later. Has the Ismail been squeezed in? 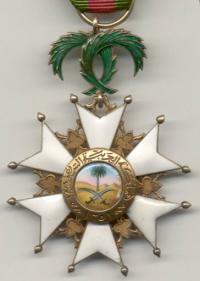 The fact that the chain includes an Egyptian Monarchy Order of Ismail and a Republic Order of the Nile is of interest - the latter was for recipients of the rank of Prime Minister of similar. the Ismail would chronologically been awarded first but it appears to be an 'extra' in this group although in seniority it may be the junior foreign award by rank or grade.